If you’re a business owner, summer is like every other time of the year: busy. Instead of family vacations and cruise getaways, there’s work, meetings, contracts, emails, work, deadlines, reports, and work. In the past, this meant spending long hours at the office and never seeing your family. These days, modern technology has allowed business owners to focus on work and family simultaneously. With the right technology, you can keep track of all your business proceedings, from analyzing performance to reviewing contracts, from the comfort of your home. 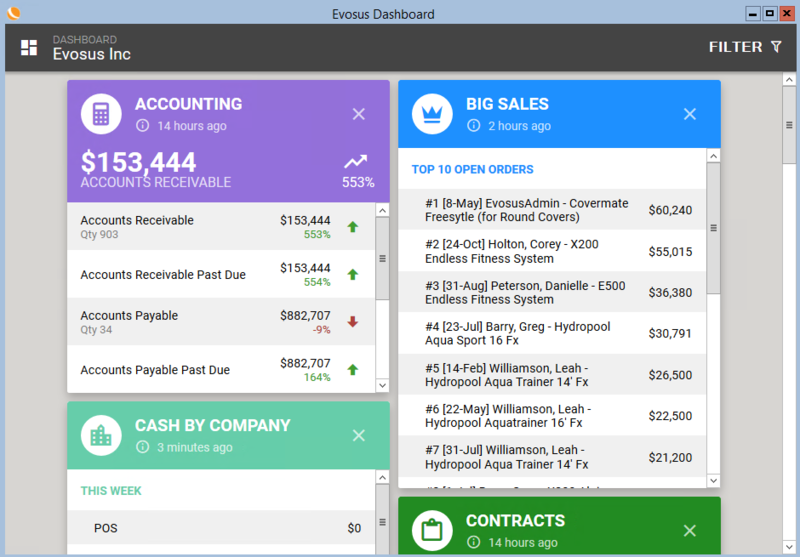 And for busy business owners on the go, no technology is more right than the new Evosus Dashboard. The Evosus Dashboard, or Dashboard for short, is a brand-new feature available to Evosus Business Management Software clients. Just as Evosus Software is designed to integrate every aspect of your business into one package, Dashboard allows you to view all your key information in one place. It’s the first thing you see when you log into your Evosus Software account. This means you can monitor activity while on the go, without having to pull reports. Best of all, it’s updated continuously, so you can manage your business as it happens. The Evosus Dashboard was designed with owners and general managers in mind. It’s included with Evosus Software version 6.6, which was released in July 2017. Dashboard is not universally accessible to all Evosus users -- only those with administrator access will be able to access the Dashboard. Dashboard access can also be granted to specific employees by adjusting their permissions. What features are included in Dashboard? Dashboard appears as a collection of colorful tiles on the frontpage of your Evosus Software account. Each tile shows specific, summarized information about your business. These tiles cannot be customized and everyone with Dashboard access will be able to view all the available information. From Dashboard, you will be able to view data from every aspect of your business, including Accounting, Point-of-Sale, Sales, Service, Jobs, Money Tree, RGAs, Big Sales, Quotes, Marketing, Contracts, Performance Analyzer, Cash by Company, Cash by Store, and Schedule Forest. This data is automatically updated in set hourly intervals. Want to quickly compare performance? You can do that, too! In Dashboard, you can customize the date range, allowing you to compare progress by year or by month. Interested in seeing how the Evosus Dashboard helps you manage your business while spending time with your family? Schedule a demonstration of Evosus Software today!